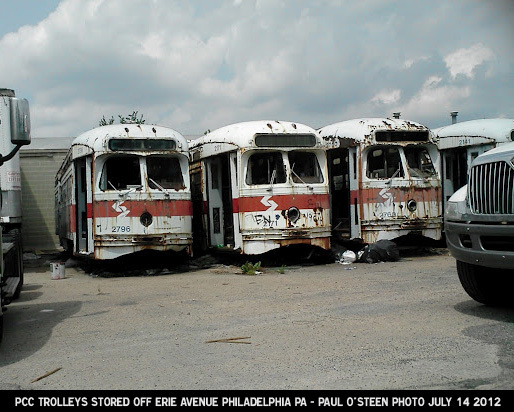 In the mid 1990s SEPTA management decided that its fleet of PCC cars were worthless junk, and disposed of them for next to nothing. 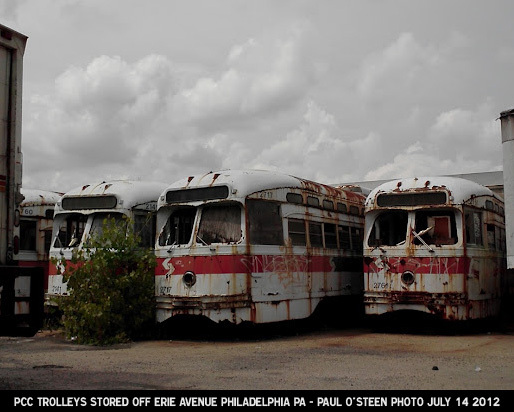 Never mind that similar trolleys (including ex-SEPTA PCC cars) were being rebuilt and were serving reliably in cities across the country -- rebuilt at a fraction of the cost of purchasing new streetcars. 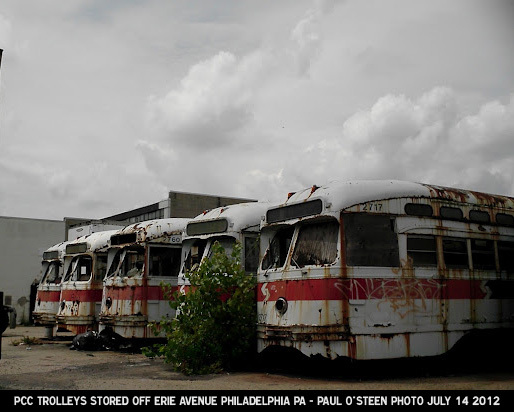 Six of the trolleys SEPTA was disposing of were purchased by one Eric Richmond in 1996 and ended up stored in a parking lot behind an industrial building on Erie Avenue. From left to right, the six are 2796, 2171, 2760, 2141, 2717, and 2761. The six are still there today. Exposed to the elements, they're showing the effects of decades of neglect. Paul O'Steen took these photos on July 14, 2012 and was so kind as to share them with this site. Update 2017: These streetcars have been offered for sale on Craigslist.